Already registered? Click here for the DLSC website. The Bus Driver Licence Status Check is a service provided by OMCA for the benefit of Ontario’s bus industry and is available to members of Ontario’s bus industry associations. It is a timely, reliable and affordable way for bus companies and transit systems to confirm at regular intervals that their bus drivers hold a valid licence. To register your interest in becoming a subscriber to OMCA’s Bus Driver Licence Status Check service, click here to sign up! A visual inspection of each driver’s licence is not enough, nor is obtaining an MTO driver abstract once or twice a year. A driver’s licence status can change at any moment; don’t be the last to know! Driver licences can become invalid for a number of reasons, including: cancellation; downgrade; suspension or ignition interlock restriction. For just pennies per driver per day, subscribers will have peace of mind that their bus drivers hold a valid licence of the proper class and endorsement. Subscribers will also enjoy savings on MTO 3-year detailed driver abstracts which can be ordered and delivered electronically through our system at any time throughout the year. The bus company or transit system submits electronically to OMCA (via secure password-protected website) a driver roster listing driver licence number, class and “Z” endorsement (if applicable). 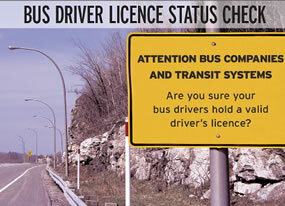 Once every three months, OMCA submits the licence numbers to MTO for a licence status check. MTO sends the results back to OMCA where they are electronically analyzed for discrepancies. Discrepancies (“hits”) are flagged and the bus company/ transit system is immediately notified by email which of their drivers has been flagged for a licence status discrepancy. The bus company or transit system can then investigate the drivers as to the discrepancy, or subscribers can order (with overnight delivery) an MTO detailed driver abstract for the affected drivers at a lower price than the normal MTO abstract fee. OMCA has entered into an Agreement with the Ministry of Transportation (“MTO”), pursuant to which the OMCA may obtain Drivers Licence Information and driver’s abstracts from the MTO. The Driver’s Licence Information consists of the licence number, and the status, class, condition(s) and applicable endorsement on the licence. Bus operators have expressed a need to be able to confirm the driver’s licence status, and to obtain driver’s abstracts, for their own drivers, on a periodic basis, for reasonable cost. OMCA has developed a service whereby bus operator subscribers provide the driver’s licence numbers, class, condition(s) and any endorsement, for its drivers to OMCA and OMCA submits this information to MTO. On a quarterly basis MTO will provide to OMCA a status report for all drivers’ licence numbers submitted, and OMCA advises the subscriber of any discrepancies between the information the Member provided and the information received from MTO (“the service”). OMCA cannot independently verify the accuracy of the Driver’s Licence Information it receives from MTO. OMCA MAKES EVERY EFFORT TO ENSURE A RELIABLE AND ACCURATE SERVICE TO SUBSCRIBERS. OMCA DOES NOT WARRANT OR GUARANTEE THE ACCURACY OF THE INFORMATION PROVIDED PURSUANT TO THIS SERVICE. OMCA DOES NOT ACCEPT RESPONSIBILITY OR LIABILITY FOR ANY ERRORS OR OMISSIONS, INJURY, LOSS OR DAMAGE WHATSOEVER INCURRED BY THE USE OF OR RELIANCE ON THE INFORMATION PROVIDED BY THIS SERVICE. Notwithstanding subscribing to this service, subscribers, organizations and their drivers remain fully responsible for complying with all the requirements of, including, but not limited to, the driver licensing requirements of the Highway Traffic Act, R.S.O. 1990, c. H8. Members remain fully responsible for complying with the requirements of all privacy laws, including, but not limited to, the Personal Information Protection and Electronic Documents Act, S.C. 2000, c.5.